One of our key objectives in the Docklands Business Forum is to promote Docklands as a leisure destination. With the restored Grand Canal Basin and the refurbished eastern Liffey Quays Docklands can soon become as popular an amenity as Dun Laoghaire pier. Our Festivals showcase to the public and local & national authorities what can be done. The refurbished canal dock, built in the 1790s, now provides a world class recreation space in the centre of Dublin. Our mix of on water activities and on land attractions is designed to give everybody an opportunity to enjoy their visit. The newly developed Grand Canal Plaza provides a uniquely modern and dynamic unban space. The local cafes, many of which face onto the water, provide wonderful al fresco facilities. Good clean fun for all the family. Over the next few years we aim to continue promoting the Docklands and help tourism to grow in the area. 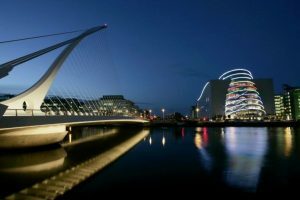 The potential for the Docklands as a tourist destination is huge!